KOTA KINABALU, 21st October, 2014 – Local graduates architects and corporate members of PAM Sabah Chapter had the rare opportunity to attend a “Members and Graduates Get-together Dinner” talk by three senior Sabah architects whose early projects paved the way for modern architecture in Sabah today. Three speakers gave their talks during the event. Senior architect Aziz Mahfar of Arkitek Bersatu (Sabah) shared his experience of being one of the early Bumiputera architects in Sabah after the formation of Malaysia and his observation of how the architectural process in the state has changed through the various decades. “When I first set foot here, Sabah (nature) was so beautiful, and mostly undeveloped. But it was a logistical challenge to access sites, especially in the Crocker Range areas due to the hilly terrain and there were no roads at the time”, said Ar. Aziz, talking about some of his projects. With an architectural career spanning five decades, he also shared some anecdotes on his experiences with past clients under different political eras in Sabah and how he as a Malay architect was even once commissioned to design a Chinese temple in Lahad Datu Township. “Clients were more open-minded back then”, as he recalled. Ar. David Kwan of Wisma Akitek presented his experience as the associate architect for Sabah’s most iconic building Menara Tun Mustapha (formerly the Sabah Foundation building), to whom many Sabahans still regard as the pinnacle of architectural excellence in construction and corporate design in Sabah. With its steel and glass facade, the Menara Tun Mustapha was the tallest building in Borneo during 1978 when it was completed and was officiated in 1979. The contents of Ar. Kwan’s talk covered the construction process of the tower complex and how it was built using the most advanced technology available during the 1970s era. Ar. Victor Wong, who is also PAM Sabah Chapter chairman, presented his talk on architecture based on his life experience, both as a qualified mechanical engineer and an architect. He described how he struggled in his early years after setting up his company, “VW Akitek” in 1983 and survived with the availability of the clean OD of RM15,000/= from Chartered Bank then. Later he was commissioned to design the Sabah Land Development Board (SLDB) Headquarter Building, Kota Kinabalu. Through strategic planning, he was able to have the building completed in 6 months by designing the foundation on solid cut ground to avoid piling work, and the use of modular design for all the partitions, doors and windows. St. Aloysius Church, Kampong Limbanak, Penampang, which houses Sabah’s largest stained glass window of 28′-0” high by 14′-0” wide is also another work by Ar. Wong. He also spoke proudly on the Tawau Regional Library of which pre-cast concrete technology was used on the facades of the building, with the biggest circular acoustic window of 6′-0” diameter. Another iconic Sabah building was the Kadazan Dusun Cultural Association (KDCA) cultural centre by Ar. Wong and he revealed that the building has the largest gong of 14′-0” in diameter and 4′-0” high in Sabah. Ar. Wong shared his experience on how the design was derived from the various cultural aspects of Kadazandusun motifs and lifestyle that provided inspiration for the complex’s unique design. “Italian Glass mosaics in black and gold color, had to be imported for the motifs in the fascias” Wong further explained. Feedback of the architectural talks from the attending guests was positive. “The talks were very enlightening”, said a graduate who only wished to be known as Ed. “To me, the highlight was the presentation on the Menara Tun Mustapha, As shown in its construction and design, for instance, the Menara Tun Mustapha is a building of world-class standard. Overseas, buildings such as these are preserved and revitalized as part of its country’s heritage.” Other graduates concurred that it was nice to get a glimpse of past architecture and experiences shared by the local senior architects. During the get-together dinner, the volunteer tutors and lecturers from the Chapter including a private quantity surveyor, who has assisted in preparing the Part 2 graduates for their Lembaga Arkitek Malaysia (LAM) Part 3 professional examination for the past 3 years under the Council of Architectural Education Malaysia (CAEM) Sabah program, were presented mementos in recognition of their invaluable services rendered to PAM Sabah Chapter. Ar. Tuan Hj. Shahriman Abdullah as chairman of Social Activities thanked the three speakers for sharing their insights of Sabah’s development in architecture and pointed out the similarities of each speaker was that each displayed a leadership role as an architect of the project, hence reminding members unless they strive to spearhead projects as the main movers and key problem solvers, the architect’s role as an industry leader will be replaced by professionals from other fields. Ar. Victor also commented that at the same time, it was important to show leadership by also working closely with other consultants and bringing them together as a team. 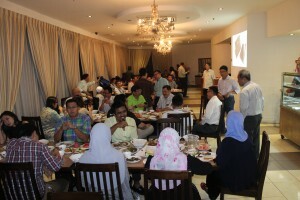 The event organized by PAM Sabah Chapter for its “Members Get Together Gathering” was held on 17th October at Restaurant Nasi Padang Ibu at Karamunsing Complex, Kota Kinabalu. PAM Sabah Chapter has organized a Design Conference in conjunction with the World Architecture Day 2014. 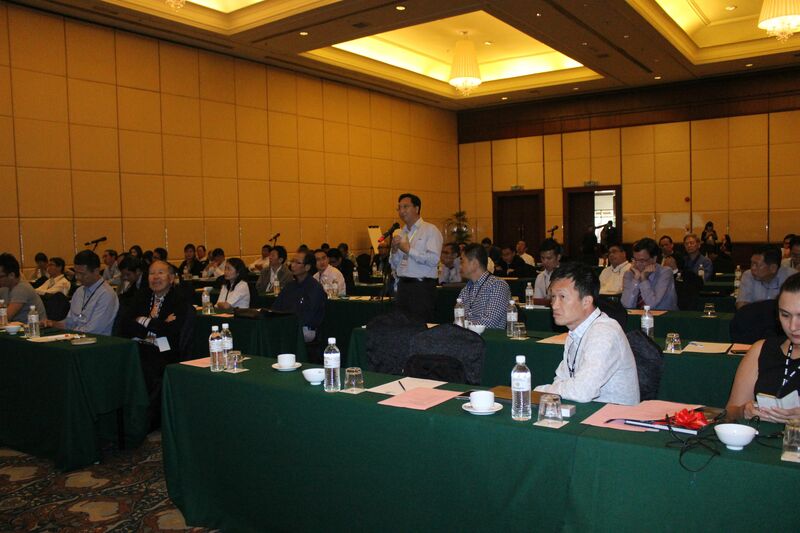 The event was held on 29th October at the Megellan Sutera Resort Hotel and was attended by its PAM Council President, Ar. Chang Seong Aun, local architects, engineers, surveyors and representatives from the various local authorities. According to its Chairman , Ar. Victor Wong, who is also the Organizing Chairman of the event, the World Architecture Day is a world wide event that is being held over the month of October each year since 2012, and it aims to bring together architects, planners, engineers and designers to exchange ideas and showcase award-winning works. The inaugural World Architecture Day was held in London in 2012 with the theme “Architects are Cities Changers” while the second one was in New York in 2013, with the theme “Culture – Architecture”. Ar. Wong further added that the theme this year is “Healthy Cities, Happy Cities” and it raises the awareness on how architects can design healthy spaces, facilities, housing and urban landscape which foster happiness, health and quality of life. It also questions by what means are the architects able to bring to life to cities, to infuse them with energy, to insure their viability and sustainability, to anticipate and heal disorders and to accompany their harmonious development. Three accomplished guest speakers from the international architectural fraternity had been invited by PAM Sabah Chapter to present topics relating to sustainable architecture, the importance of design analysis in modern architecture, religious buildings from an architectural perspective as well as inspiring a change of mindsets about built environments through good architectural design. Ms. Ayca Ozcanlar from Arup Singapore shared her expert insights on sustainable architecture in her presentation titled ‘Designing Sustainable Facades‘, stressing to the audience of the importance of implementing sustainable architecture in the face of increasing and alarming global warming effects around the world; weather changes, of which have also been experienced in Sabah. The Turkish-born architect cited several key advancements in facade design technology and discussed the main factors of evaluating a successful and efficient sustainable design facade system. She ended her informative presentation with examples of ongoing projects by Arup Singapore that are currently incorporating sustainable design facades and how good designs add value to building properties. During the Q&A session, Ozcanlar also suggested how existing buildings could also implement sustainable designs to boost better energy efficiency. Architect and academician Vikram Lall from India presented the topic of ‘Architecture of the Buddhist World‘ and shared his discoveries of ancient building structures built to cater for Buddhism and how its various architectural styles was influenced and shaped by the early cultures and populations around the world that adopted its spiritual philosophies. As a published author on this subject, Lall gave a brief synopsis of his findings on Buddhist architecture from an architect’s perspective, and summarized his research as an attempt to understand the process of architecture as well as the intent and solution behind the various forms of buildings. Landscape architect Leonard Ng inspired the audience with his presentation of Landscape – The Future of Urbanism. As he conveyed the message of ‘Designing Loveable Cities‘ to the attending crowd, Ng discussed the emotive value of designing with the element of water, using case examples of how Singapore has transformed undesirable urban amenities such as flood drains and illegal dump sites into popular and conducive community activity areas, thus adding intrinsic and monetary value to development properties affected by these urban features. However, in order to succeed in these respects, Ng stressed to that all parties involved including local government departments must be willing to collaborate in their urban design and allow for an overlap of responsibilities in regards to maintenance of the said amenities in its new design and form.